The brilliant film, Sorry To Bother You, is more than just funny, it’s a cerebral and visual treat. Dealing with classism, capitalism, racism, stereotypes, and challenging clichés and tropes, in a very, very fresh way. I loved it. Not only was I lucky enough to see a preview of it today, my cake got extra icing this afternoon from a really interesting talk by the writer-director, musician and all round talent, Mr Boots Riley himself, talking about his life influences, his musical background, the process of developing this film and questioning why films are so scared to really address and portray some of the realities of life. I even managed to get a picture with him afterwards! 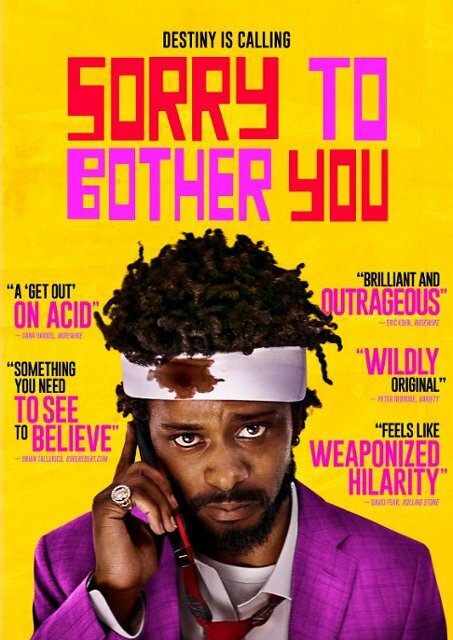 In Sorry To Bother You, Lakeith Stanfield plays Cassius Green, a totally charming chancer living in his uncle’s converted garage and dating super-cool, eclectic artist, black activist and class warrior, Detroit (played by Tessa Thompson), who creates political art in formats varying from street signs to semi-naked gallery installations. Pressured into finally making some money, the shamlessness of his blag in an interview at the call centre where his best friend works, actually gets him a job. But Cassius soon finds himself in the depressing daily grind of being a salesman who doesn’t make any sales. One morning on the way into his grey office, he notices an immaculately-dressed, super-fly guy going into an ornate lift across the hall. When he learns that the lift is for the Power Callers: The tops sales people, who make the real money, Cassius decides that he wants in on that. Advice comes from an older, more experienced sales guy, played perfectly by Danny Glover, who breaks it down for him. If he wants to do well on his calls, he needs to use his ‘white voice’ on the phone. “Not Will Smith white.” A real white voice. “Like when you get pulled over by the police”. So, Cassius practices. At first, no-one is more surprised than he is when he pulls it off (with David Cross ‘playing’ his white voice). But, as the customers start to love him and the money starts to roll in, his position in the company, his relationship with his girlfriend and his friends, and his place in society changes and Cassius is faced with numerous moral dilemmas and is forced to decide exactly what kind of person he is and wants to be. It’s surreal and sordid in some parts. Thought-provoking, truly-ingenious and very, very funny throughout. From Cassius and his desk literally dropping into the personal space of the people he’s ringing, no matter what they’re doing or where they are – from sofas, to bedrooms; to a mad ending involving a horse (! ), Sorry To Bother You is out there. Yes, it addresses classism, racism and society’s hypocrisy towards both, whilst also highlighting the way that big corporations treat and underpay their staff. But it still manages to be stylistic to the max and I can guarantee it will keep you laughing – and sometimes also open-mouthed. Brilliantly acted, directed, shot and art directed, the film does a beautiful job of making a political statement, almost without you realising. Did I mention that I totally loved it. Sorry To Bother You, featuring music from Boots’ band, The Coup, launches at the London Film Festival tonight. And then goes on general release in London on Friday, 7th December. You’d be a fool to miss it. 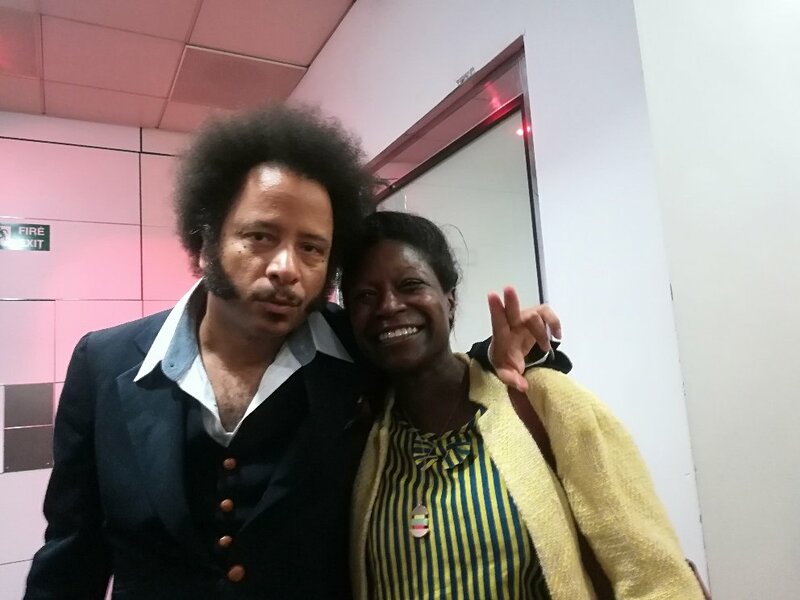 This entry was posted in America, Film, Funny, Inspiration, Interviews & Talks, Latest News, Review and tagged BFI, Boots Riley, BootsRiley, film, filmmaking, LFF, lff2018, London Film Festival, londonfilmfestival, music, Sorry To Bother You, SorryToBotherYou, The Coup, TheCoup. Bookmark the permalink.